Almost immediately after I bonked the Virginia Beach Marathon (thanks to that dreaded calf injury almost forcing me to crawl) I was online looking at the next Boston qualifier. I was hopeful to sign up for a new race that would lead me to next year’s Boston starting line. Actually, I spent way more time than I’d rather admit trying to find a race that would suit. With the heat quickly approaching Texas and surrounding states nothing was available locally so I was left with options in the northwest and California. I reviewed course maps, reviews on marathon.com and looked at the “Best Boston Marathon Qualifiers” all over Google to try and nail it down. I tentatively decided on either Ventura or Salt Lake. Both races were the end of August and early September respectively. And, Boston 2015 cut off is estimated to be mid September although not officially released yet… So, I really only had summer to work with. But as April continued on my recovery and progress was still very slow. I was frustrated, scared to get hurt again and confused what my next move should be? 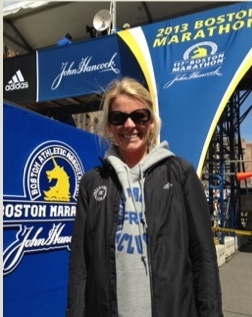 The Boston Marathon arrived on the 21st and my heart hurt not being there. I remember meeting Paul at the coffee shop that day and having a very emotional time – I wanted nothing more than to be back in 2015. His response was, “Wasn’t this the year of the Triathlon?” “No, well, I want to do it all!” He just smirked, like, “Ok, yeah right.” I was angry because I could! I told myself I would do whatever it took to be in Hopkinton next spring. But, I still had about a month before I was “officially” released to run — then I started doing the math. Could I really ramp up for a marathon – a Boston qualifier by the end of August with no base training? And, was it really smart to jump right back into track, hills and interval training on an injured leg? I knew the answers. I didn’t like them. But, I knew…. Triathlons are no joke – don’t get me wrong! It’s more time, energy and day-to-day planning to keep up with three disciplines. It’s a whole new world for me and I’m learning every day and with every workout. Will I have a hard time watching Boston 2015? You bet. But, Boston will always be there and I’m not going anywhere. I’m just TRI-ing something new — for now. Boston – I’ll be back!